You have Lyme Disease, huh? Lyme Disease is rough, and facing it can often leave us questioning everything we thought we knew about health and ourselves. Some days we may have moments where we feel relatively “normal” before we’re spun into a place of pain, neurological symptoms, and grief. For me, personally, most days are pretty rough. Since my diagnosis, I have seen some better days, but they are always followed deep valleys. Treatment may be working, but when you add in Herxheimer (die-off) reactions and flares, healing doesn’t seem to come as quickly as I would have hoped. Each day is a battle of both the body and the mind. In order to help myself heal effectively, I have to remember a few things. If you’re also fighting Lyme Disease and co-infections, these simple reminders may make a difference for your outlook. Lyme Disease can leave us questioning everything we thought we knew. At some point you may face an identity crisis (or if you’re like me, you might face it over and over again), but it’s important to remember that the disease is not who you are. You are not crazy. For years of my life, I felt like I hid a secret – the secret that I was crazy. My family knew about it, but anyone on the outside had no idea. My emotions were a continual roller coaster and I felt like as hard as I tried, I couldn’t control my mind or body. Pairing my emotional roller coaster with the way doctors acted about my symptoms left me questioning myself over and over again. To this day, I still have times where even though I know that Lyme and co-infections are causing the problems, I still think that maybe I’m just crazy. If you have emotional highs and lows caused by Lyme Disease and co-infections, please know that what you are experiencing is real. You are not crazy; the disease is messing with you. Repeat: NONE OF THIS IS YOUR FAULT. I mean it, sister (or brother). When times get tough (especially when dealing with neurological symptoms), self-blame may enter the picture. You need to squash it. Blaming yourself for what’s going on will only hinder your healing. While we must make choices about which treatment to use and how to care for ourselves while fighting Lyme, the fact that you have Lyme is not your fault! Keep choosing to do the next right thing in your treatment and press forward, knowing that you’re doing what you can do. Actually, it’s a lot more than okay to ask for help – it’s good! Even if you were always a self-reliant person before getting sick with Lyme, you will probably get to a place where you need help. Even if you can do something for yourself, sometimes it’s wise to ask someone else so that you don’t use your limited energy on that one thing. Not sure who to ask? Here are some ideas: family, friends, coworkers, church family, neighbors, local non-profit/service organizations. Even if you can only think of one person to ask, ask them. They could have ideas for others you can ask for help. The important thing here is to be honest about your needs. Honestly, this is one area I need to constantly reinforce to myself because I am not good at resting well. Sure, I spend a lot of hours at home in bed, but while I rest my mind goes off in a million places about all of the things I need to do for work and at home. I’m often stressed about money, thinking about how I’ll be able to pay my expensive treatment if I can’t be at work full time. Add in the extreme fatigue and insomnia and I’m always wanting rest but then not enjoying it when I actually get it. I need to change my mindset on it. When resting, I need to be thankful for the gift of rest and what it will do to support healing. We, as Lyme Disease patients, cannot undervalue quality rest. Our bodies need it, so when we have the chance to rest, we need to love ourselves enough to embrace it instead of fight it. There is no one size fits all treatment for Chronic Lyme Disease. We are all made unique and the way we respond to treatment is unique. So, when it comes to treating Lyme, a wholistic approach is needed. It may take time for your doctor to figure out how you respond to their first approach, and then your treatment protocol will need to be adjusted until you find the right plan. It takes time and patience, which can be frustrating. Just because a treatment worked well for a friend doesn’t mean it will work for you. There’s nothing to blame yourself for; it’s just how your body responded to it. Most of us Lyme Disease patients spend time researching the internet for treatment ideas. While it is beneficial to be educated on our options, please remember to not get discouraged if something doesn’t work for you as well as it did for someone else. So, I said I was going to share five things to remember, but I couldn’t end this without reminding you that you are not alone. I understand what you are going through, and I’ve learned that God can be so gracious to hold us in our weakest moments. Many others have been or are still where you are right now in battling Lyme Disease. You don’t have to do this alone. I’d love to share a resource with you to help you cope during life’s darkest moments. I wrote a short eBook guide specifically for those dealing with chronic illnesses. 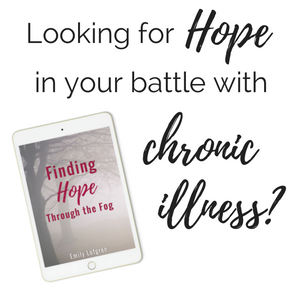 Here’s your free copy of Finding Hope Through the Fog. *Emily Lofgren is a not a doctor and is not able to diagnose, prescribe a treatment plan, or give medical advice. The intent of this website is to share personal experiences and no information here is to be used as medical advice. Please seek appropriate medical care. I was diagnosed with Lyme July of last year. I still feel as if I’m battling it from day 1. Thank you for this post. It offers encouragement that I needed. SO TRUE! This really encouraged me, as it clearly targeted all the things that are so easy for me to fall into in thinking of my Lyme! Thank you so much for this post. Hey! I’m 16 years old and I have Lyme co. along with other health issues. I just found your blog on pintrest and can’t wait to read it all. I am a Christian as well and don’t know I would be able to get through this with out God. It is wonderful to see another girl with my same view points, keep it up please!!!!!!! Hi Charis! So glad to connect with you! Thanks so much for reading. I’m really glad to hear of your strong faith and that you’re pressing into God during these health challenges you’re facing. Praying for you today! Thanks for this. Even though I don’t have lyme disease, I do have other chronic illnesses. I can really relate, especially to your point about God holding us :) Thanks for sharing! Hi there! Thanks so much for reading. Yes – God truly does meet us in our pain! Thank you for for this lovely and on point post! A much needed reminder. Such a complicated and weary journey we are on – finding our way to wellness. Sending healing hugs and blessings to you. ? Thanks so much, Terry! It sure is a difficult journey, but God is so faithful to meet us in the midst of our pain! This post totally applies to all chronic illnesses, although the struggle for diagnosis is especially tough for Lyme. I really like the points that this is not your fault – it’s hard not to look back and wonder if I pushed myself too hard or ignored my body too much, and that it’s ok to ask for help. No one is an island, and while chronic illness makes that more obvious than for healthy people, it’s a universal. Sometimes I’ve seen the power of love when I did finally ask for help and that made it worthwhile. Great post! Thank you so much for reading, Katarina! I also appreciated your thoughts. There’s this constant internal battle that seems to go on in those with Lyme and other chronic illnesses as we try to figure out if we should push or rest. What you said about seeing the power of love when asking for help is spot on! Thank you for sharing this, Emily. Such important, powerful truths that we ALL need reminding of. I so appreciate your caring heart!